From the moment writer Jenny Ceretti spots Susan Fredrickson at the Village Coffeehouse, her serene life begins to change. As their friendship explodes into a tempestuous love affair, Jenny discovers that all is not as it appears. While Susan is haunted by a terrifying past, Jenny comes face-to-face with past ghosts that no longer will stay hidden. Sweet Bitter Love explores a relationship that walks the fine line between compassion and codependence. The reader sees the relationship from Jenny's point of view, from her beginning fascination with Susan, through to the end. It is an interesting look into the highs and lows of life with an alcoholic...This is not an easy subject ...It is, however, a situation common to many. Schiano has opened the door to an important subject that few want to discuss. 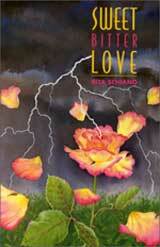 Notice: This title was originally published by Rising Tide Press in 1997 and bears its ISBN. In 2003, the author regained exclusive ownership of all rights to the work. The Reed Edwards Company distributes the book on behalf of the author.